humor in the midst of disappointment…. – Journey to my heart…. humor in the midst of disappointment…. I lacked planning, discipline and self-control…. I used the rationalization and internal argument that because I had good (and even great) workouts, I had the right to eat things I should have passed up…. It wasn’t a great week…. I want to be about living true to my vision to be a woman of wellness…. I am hitting the gym at 7 and 3 tomorrow. I hope to get a bike ride in. I plan to have a fruit smoothie for breakfast, almonds mid morning, tuna for lunch, peanut butter and an apple mid afternoon and chicken and broccoli for supper. It feels good to have a plan…. 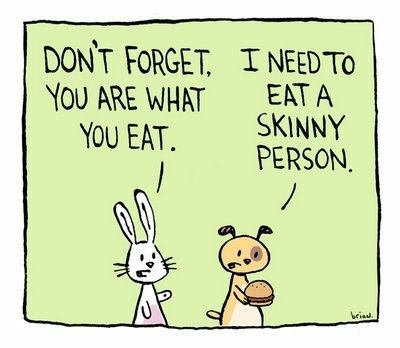 And today I find this comic to be so funny….so watch out skinny people! Previous Previous post: Run like the wind…. Next Next post: Sunshine on my shoulders….